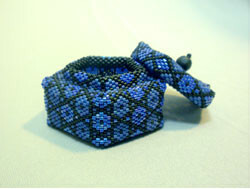 You won't believe how firm this box is beaded. 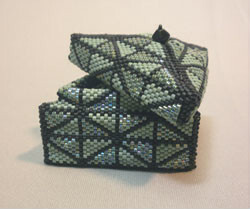 The contrasting shiny and matte Miyuki delica beads offer a wonderful combination of color. The lid fits perfectly–both physically and pattern wise. Made by Laurel Kubby. 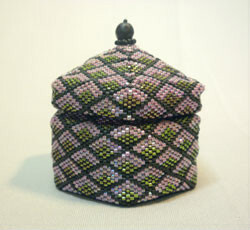 This pink and green six sided box has a star pattern when viewed from the top. The lid fits perfectly–both physically and pattern wise. Made by Laurel Kubby. This miniature lidded box has five sides and a star pattern when viewed from the top. The lid is a perfect fit–both physically and pattern wise. Made by Laurel Kubby.